In the foreground is an ox with hump and large horns and par or rial markings (depending on the colour). 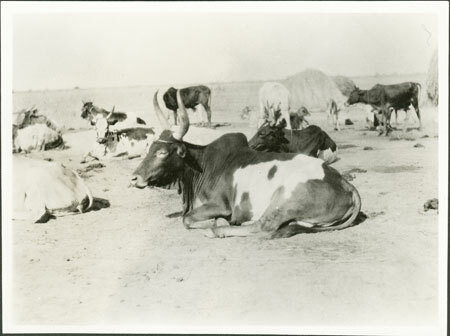 Other cattle belonging to the homestead can be seen beyond, with the thatch of huts just visible to the right. Note on print reverse ms pencil - "31/7 91 "
Morton, Chris. "Nuer cattle" Southern Sudan Project (in development). 03 Jan. 2006. Pitt Rivers Museum. <http://southernsudan.prm.ox.ac.uk/details/1998.346.91.2/>.